Gary commented was that he wasn’t killed by his enemy, but by the sea – and that it would have been more honourable to die in battle. An odd comment from a guy that spend half of his first battle hiding in a swamp… but he makes a very good point. I don’t th ink I want to completely remove that, but think I would change the sea losses to a d3 instead of a d6. 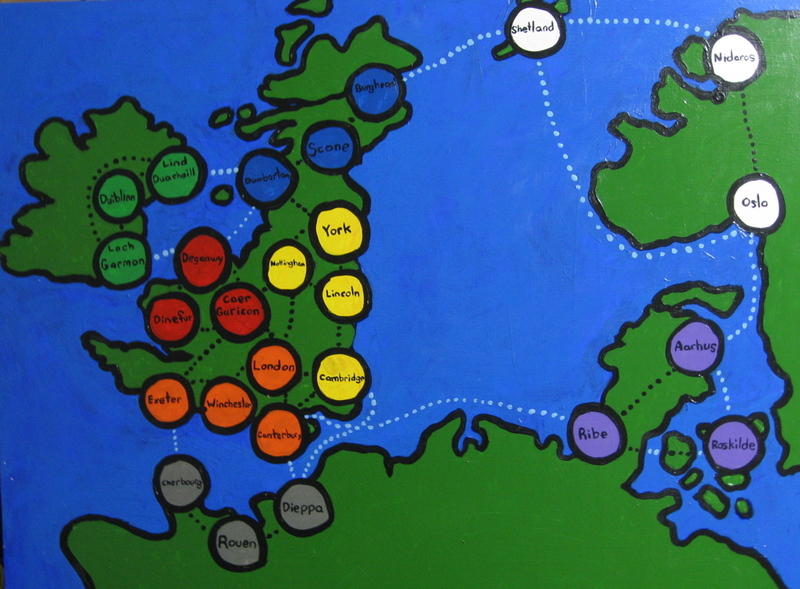 I might also make SOME sea routes “safe” mark them in black like overland routes and they wouldn’t have to be diced for in the spring or fall. I’m thinking mostly of the two routes into Roskilde. I’ve effectively done that with the route from Oslo to Nidaros – I doubt very much that there would have been a regularly used overland route between those two areas and that most travel would have been by boat following along the coast. 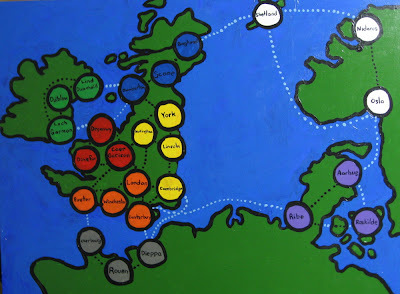 I’d definitely add one from Shetland to York, and probably from Oslo to Ribe and/or Cambridge. I might also consider Lind Duchail to Nottinghanam and/orLoch Garmon to Exeter? Would Lind Duchaill to Deganwy put too many routes into that area? This has gotten me pretty stoked about the idea of painting up a few Greek Hoplite armies for a Greek City-State War/Peloponesian War campaign (well, and the fact that my kids are nuts about Ancient/Mythic Greece right now… and I HAVE figures for two Hoplite armies and have already started them… and the fact that Jackson already has a Spartan army!). I think one of the advantages to such a campaign is that all the participants would have more or less the same army, removing the trump card army of the Normans. 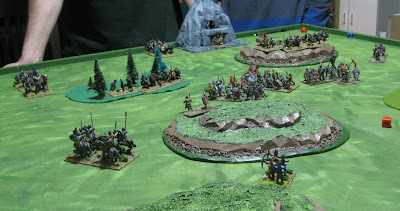 A feudal Japan campaign as Phil suggested in the comments on the previous post could also be similar (and a bit more dynamic – as there would be a few more troop types to play around with – yet everyone still has a pretty level playing field). 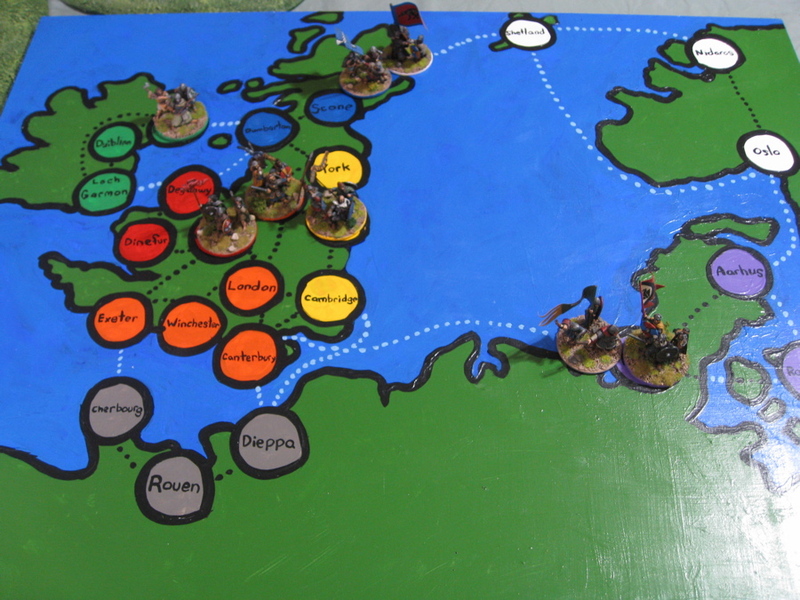 The one thing I worry about in adding East and West Franks to this map is the addition of two Knight-heavy armies… It would be idea if they would quarrel among themselves, but if you get two friends running them they could end up destroying everyone. 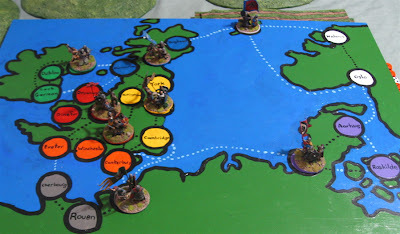 An interesting idea from the simple rules laid out in the DBA3.0 draft that could easily be added to this system and remove the two friends back to back issue is adding a bunch of cards with the names of all the countries on them which are dealt out at the beginning of each year. If you are dealt a card with the name of a player that you currently share a border with (i.e. have a direct travel route from one of your cities to one of their cities) you MUST declare war on them and attack them in the spring. There was a problem with forcing players to attack other players and letting other players know about out in a previous campaign – other players could potentially take advantage of that knowledge and attack a neighbor that they knew would be busy attacking their other neighbor. 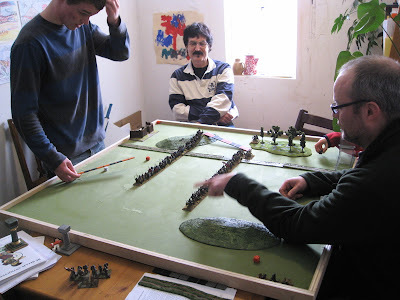 This could easily be circumvented by doing it during the declaration phase AFTER all the players had secretly written down who they want to declare war on and simply add the card drawn to their declarations – or even deal it out before declarations are made but do it secretly so players can decide NOT to invade BOTH neighbors (if they’d originally been planning on invading the opposite neighbor indicated on the card). Does that make sense…? Oh I forgot to mention elsewhere - the one change we made to the 3.0 rules was to add a caveat to the rules involving placement of terrain - that when dicing for a quarter to put a terrain piece in if the result indicated a quarter in which there was already a piece of terrain, the defender may roll again, but most accept the outcome of the second roll. I think this worked very well. Some of the earlier games of 3.0 ended up with some very lop-sided terrain. I don't think there was anything really terrible in any of the fields of battle generated by our tweak. Also we added that bad-going much be diced for first - because it was conceivable that if you had all gentle hills plus one piece of bad-going - if the bad-going was diced for last I could possible be placed in a quarter in which there was no room and therefore be discarded which could leave a table without any bad-going at all! Anybody else have any ideas…? Please leave a comment! 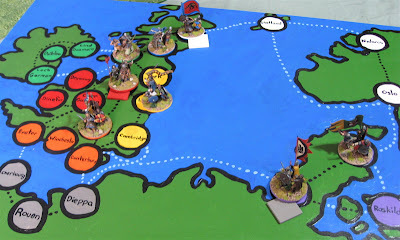 IN this third and final year of our saga The Norse, Scots, Irish and Welsh all declared war on Wessex! 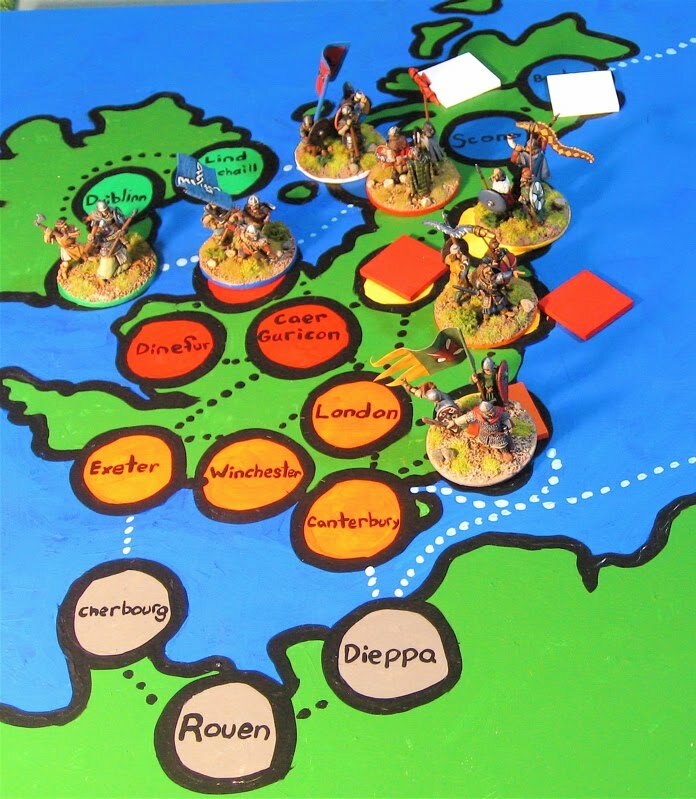 Wessex and the Normans declared war on the Welsh… Mercia declared war on no one. And the Danes declared war on Norway!? 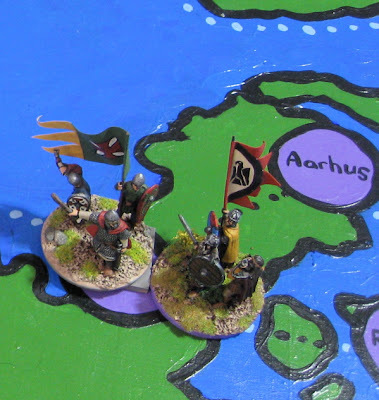 The Danes started the year with their grand army of three elements (just enough to spend a whole year besieging cities up north) mustered in Aarhus. The Welsh rallied to the flag in Caer Gurricon. The Scots started in Dumbarton. The Irish wandered south to Loch Gurricon. The Army of Wessex started in their capitol of Winchester. The Norse remained in Burghead. 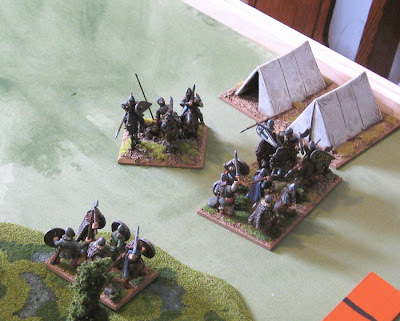 And the Normans started off on the coast at Dieppa. It was no surprise that the Danes sailed for Oslo and laid siege to it. 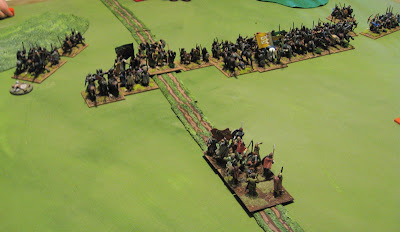 They had no trouble getting there but the defenders proved resilient and the Danes numbers slowly melted away (mostly due to men deserting to run off with the local ladies and start up new farms of their own…). 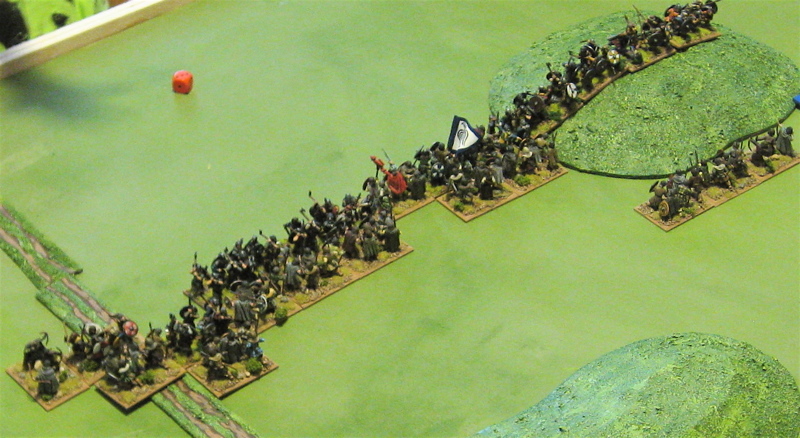 The Welsh Marched on London but found no the Army of Wessex there, but the Horsemen of the Normans, freshly across the channel! 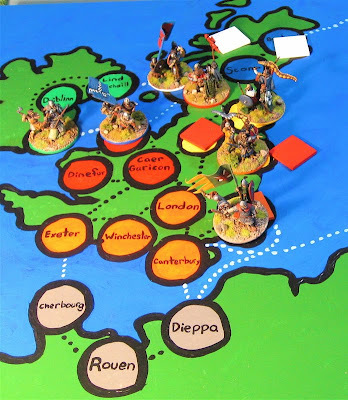 The Mercians marched into their old town of Nottigham to send a contingent to aid their overlords and the Irish Sailed across the sea to Deganwy and marched further inland to Caer Gurricon to also aid in the attack on Wessex. A token contingent of the Army of Wessex marched out of Winchester for London to aid the Normans who were now fighting their battles for them. Perhaps they were waiting for the contingent from Wessex that arrived. As the Wessex and Irish contingent rushed to the front line, some Norman knights galloped around the Welsh flank. As the Knights on the flank began to roll it up, the main line of Norman Knights charged the main Welsh line. 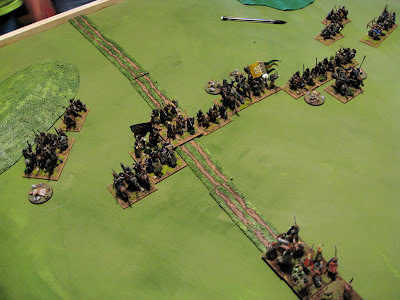 Having made such a hole the Normans turned out and stared making their way toward the flanks rolling up the line from the center!? 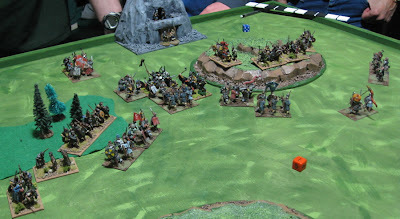 The Welsh lost four Warband and a Psiloi, The Normans two Knights. 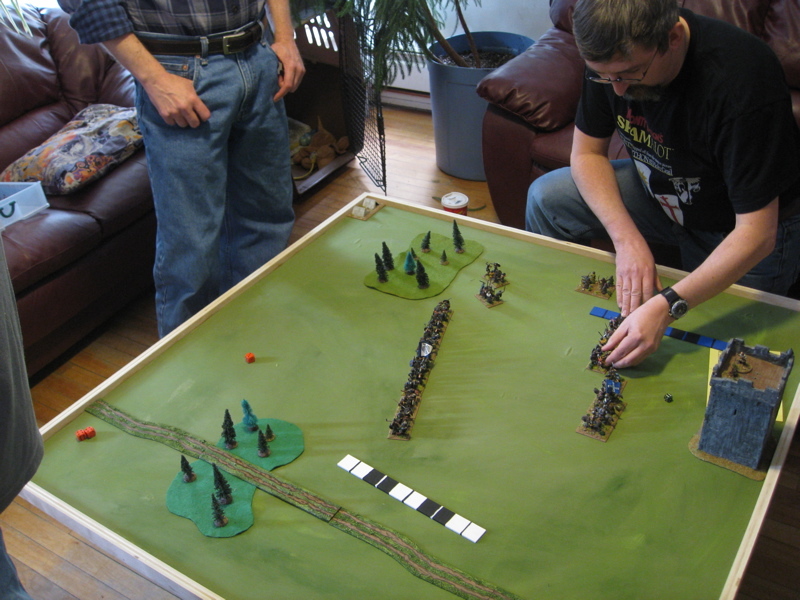 The Normans netted 3 Victory Points. London remained part of Wessex. 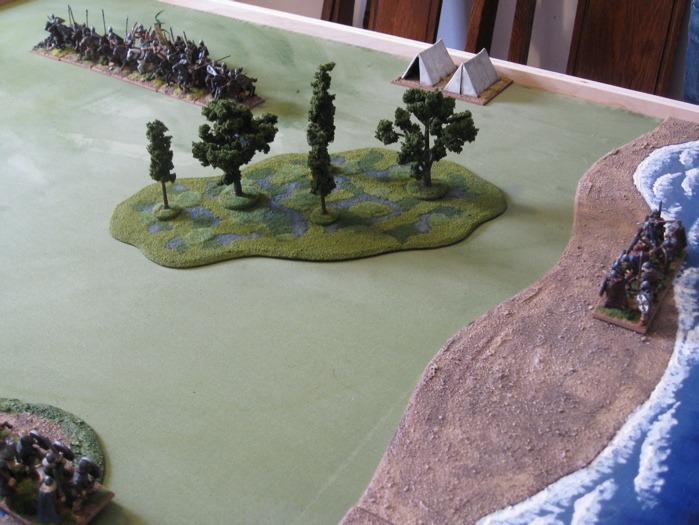 The Welsh were obliged to retire to Caer Gurricon and the Irish were bumped back to Deganwy. The Mercians remained in (Welsh!) 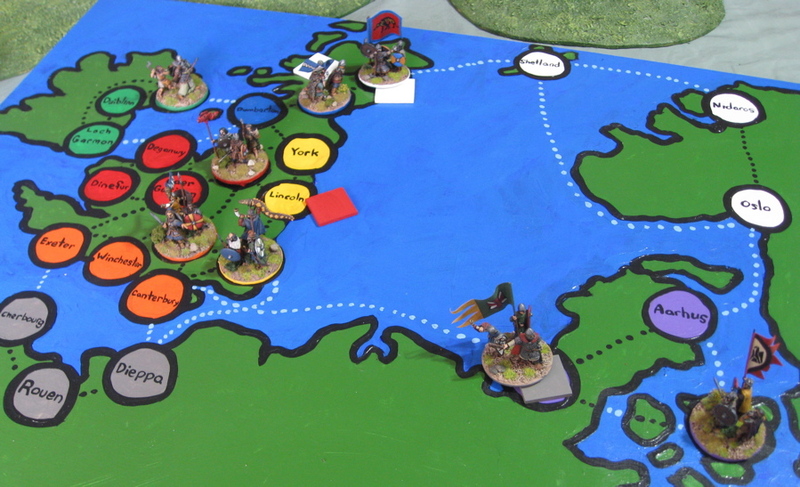 Nottingham and the Scotts held in York but sent a contingent to aid in the defense of Wales. 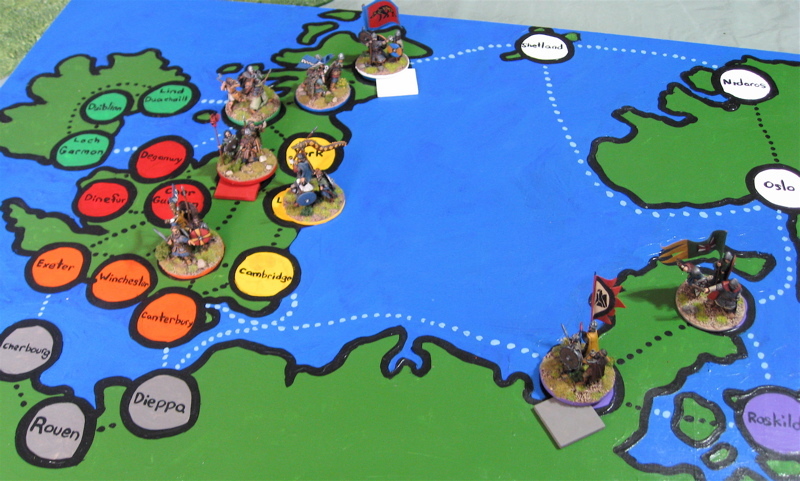 The Army of Wessex passed through London on their way to Caer Gurricon, picking up a contingent of Normans to aid them in the Invasion of Wales. Setting up a peaceful stretch of the Welsh countryside. Cory even got out some of his camp followers – including his wooly Highland cattle. 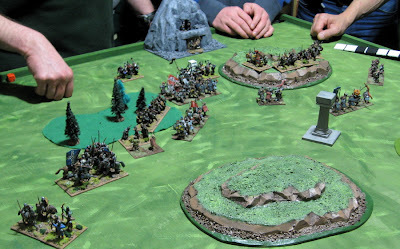 The Welsh mountain stronghold looked strangely similar to a Dwarven stronghold…? The view from the Welsh side. 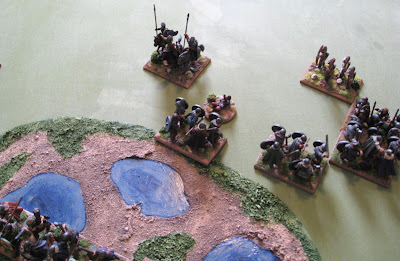 Shortly after the Scots and then the Mercians arrived! The board started looking rather crowded! 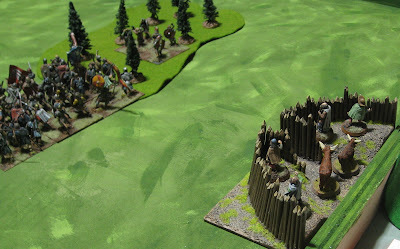 Groups of Saxon spear stood at the bottom of the hill and just outside the forest to encourage the Welsh to stay within or upon while the rest went off to fight the Newly arrived Mercians. 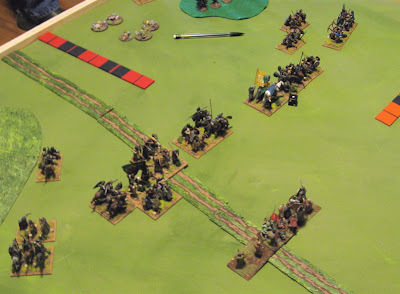 Meanwhile the Scots and the Normans had a little cavalry battle on the flank. 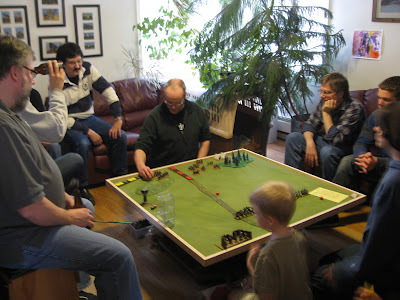 My mind was shutting down at this point… Luckily I wrote down that the Welsh (and friends) won. 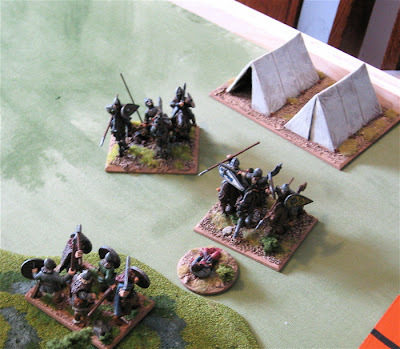 Wessex lost an element of Spear and an element of Psiloi, while the Normans lost two Knights and their bow. The only losses on the defending side was an Element of Scottish Cavalry. The Welsh scored a victory point, as did the Mercians, and the Scots scored TWO! Pretty good for an allied contingent of three stands! 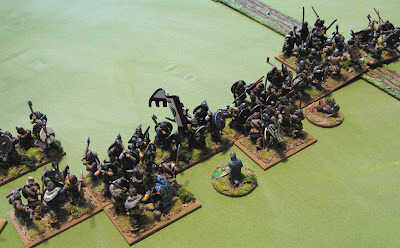 The Norse, worried the Danes might take Oslo this season, sailed back and tried to relieve the siege. They sailed through some rough seas along the way and lost two elements of Blade in the process. 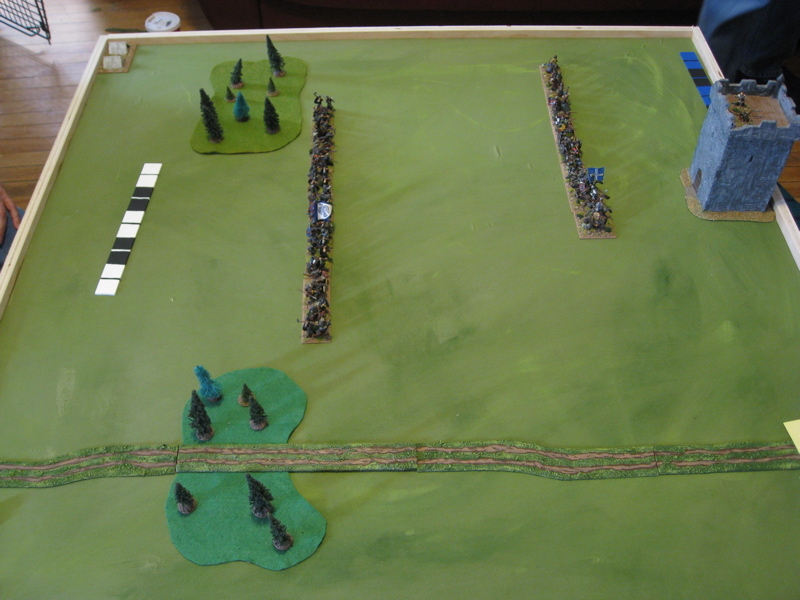 The Irish marched through Caer Gurricon to London hot on the heels of the Retiring Army of Wessex. 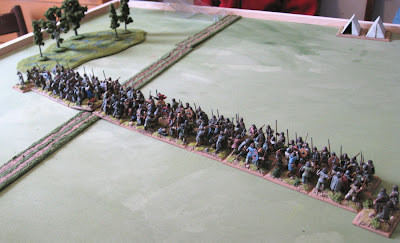 At London they found the remains ofhte Norman army waiting there for them, while the Army of Wessex continued on to Winchester. 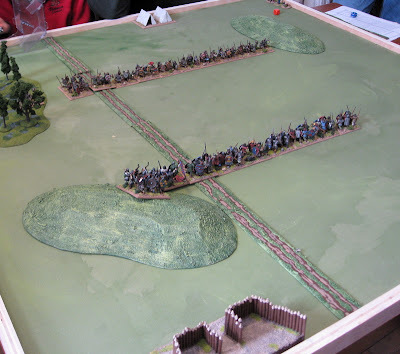 The remains of the Norman army lines up to defend London. The Danes were wiped out again and Oslo remained in the possession of the Norse. 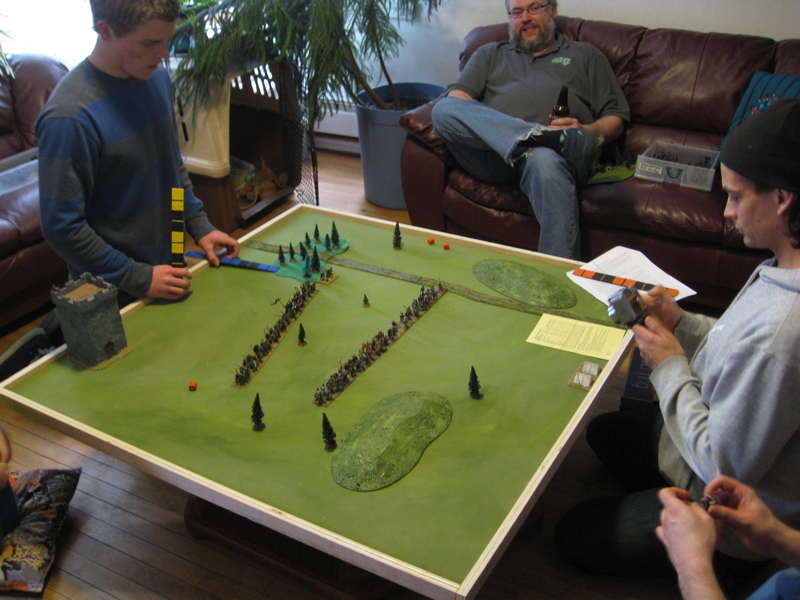 So Rowan and Rick were exactly tied at 23 Victory Points! 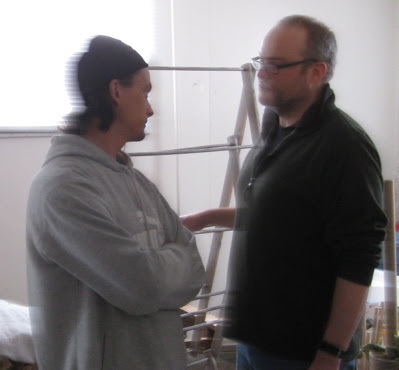 There was considerably more negotiation before the beginning of Year Two – pairs and groups sneaking off to different corners of the house to try and make deals and plans…. There was a tad more beligerance this second year. Weesex declared war on Mercia!? Persumably to invade and free them from the shackles of Welsh oppression…? 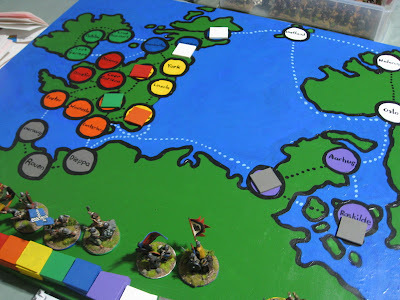 The Scots also declared War on Mercia… as did the Norse… In return Mercia declared war on The Scots and... Normandy? So Mercia ended up at war with Wessex, Scotland, Norway, and Normandy… half the map. The Welsh declared war on Scotland and the Irish declared war on no one, once again… Though technically, due to the Norman’s bizarre declaration, they were technically “at war” with Normandy!? In the Spring The Mercian Army rallied to the flag at Cambridge and the Army of Wessex gathered at London. 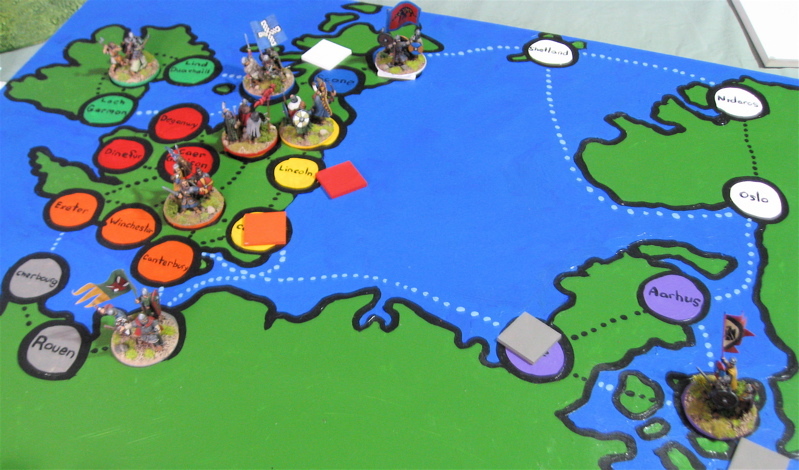 They planned to march to each other’s territories, but WEssex was apparently more efficient in their preparations for this years campaign and marched into Cambridge before the Mercians were ready to move. The Scots overwintered in their capital of Scone and there they stayed throughout the spring, presumably rebuilding after the sacking by their new overlords… The Norse overwintered in Burghead to get a quick start on things in the spring, and marched to Dumbarton as early as it was possible to do so. The Welsh Gathered in Nottingham to begin their campaigning this year, but only marched as far as York in the Spring. The Danes were quick to march on Ribe in the spring. 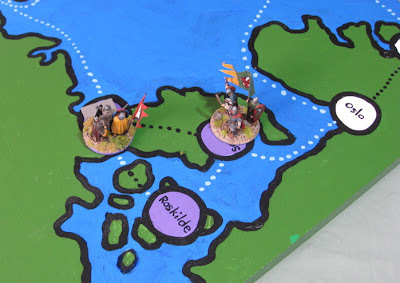 They moved swiftly (which was easy enough, due to their lack of numbers…) and caught the Normans before they were ready to march (as the Normans had, indeed, planned on sailing for Roskilde this spring). Rowan obligingly brought the fight to the “attacker” (that’s the spirit). 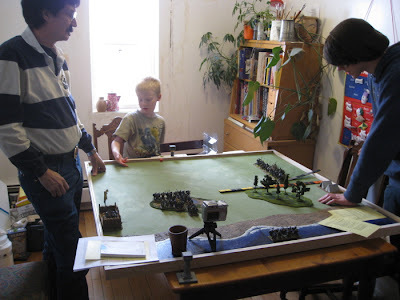 Technically he could have sat at his edge of the table and said “go on, attack!” for an hour (or until I got bored) and declared victory for the defender (due to the attacker failing to actually attack). The Normans scored two more victory points (they lost an archer, The Danes lost their General and an element of Balde). 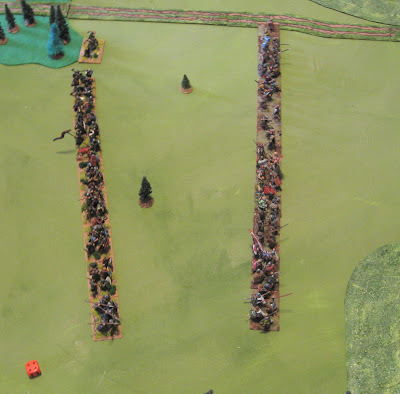 The opposing English armies line up opposite each other. 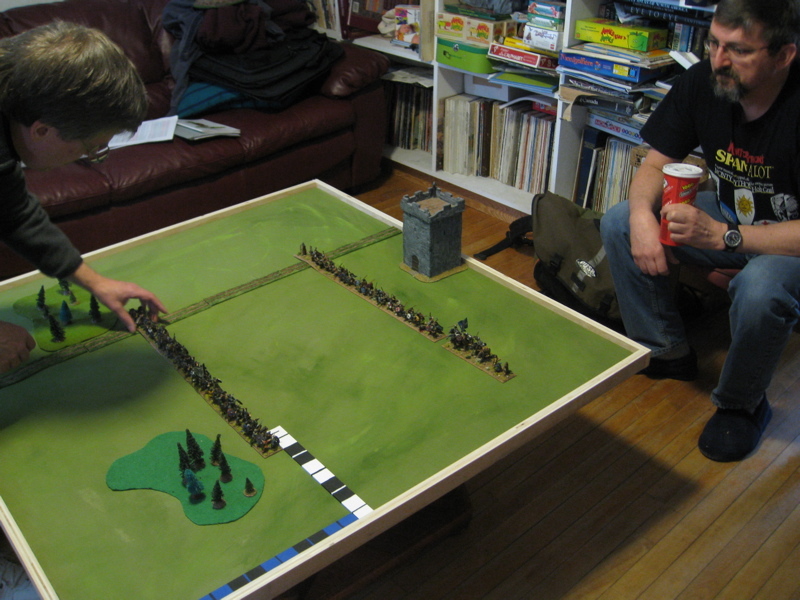 Jackson (Mercia) left, and Cory (Wessex) right. John (Ireland) is on the couch drinking beer and heckling as any decent Irishman should! The lines meet and chaos ensues. The battle, I recall, was pretty quick and rather one-sided. 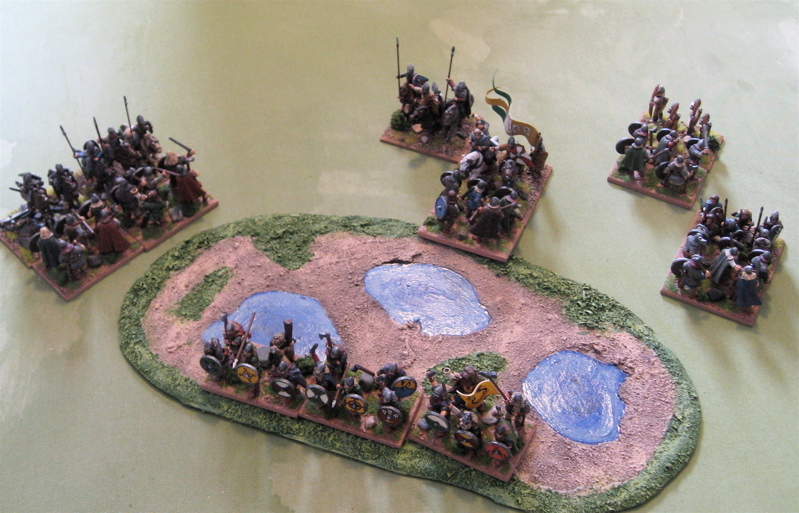 The Mercians lost an element each of Spear, Blade and Psiloi, The Army of Wessex ended the battle relatively unscathed. The Mercians simply had no fight in them. 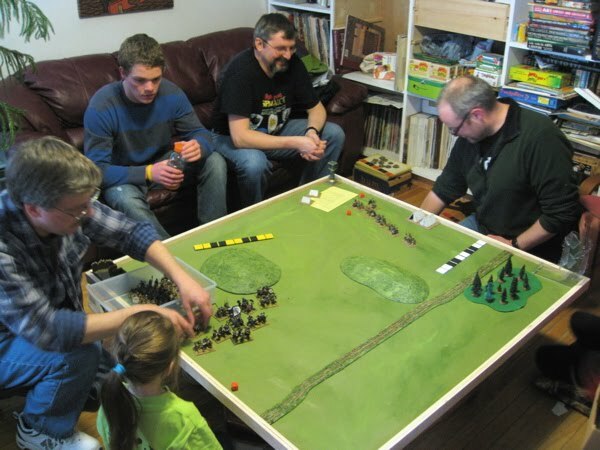 Probably demoralized from being beaten by the dirty little Welshmen and having to accept their harsh overlordship… Can you blame them? The Scots had actually snuck past Dumbarton and sailed for Deganwy and laying siege to it! 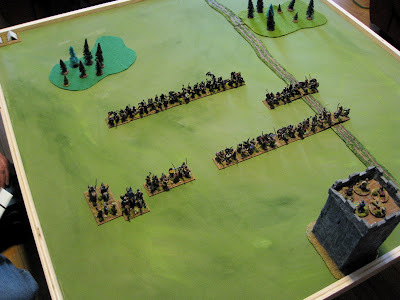 The Welsh sat in their hilltop fortress and rained insults and rocks down on the Scots throughout the summer to which the Scots had little to reply – lacking wit and proper siege equipment…. The Siege dragged on into the fall. The Irish, just to keep everyone guessing about whom they might come to the aid of, marched south to Loch Garman… would they sail across in the Autumn to lift the Siege of Deganwy…? 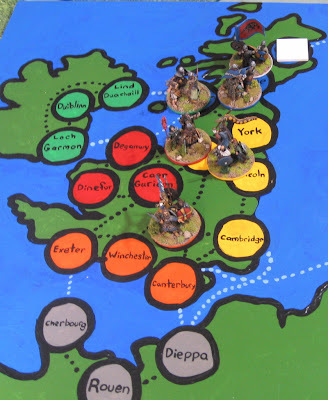 The Mercians fled to Lincoln and kiept on going right up to York. Into the vacuum they left the Armyof Wessex marched, laying siege to Lincoln. The Welsh garrison proved a little harder to winkle out than the Mercians did on their own the prevous year. This siege also dragged on well into the fall. 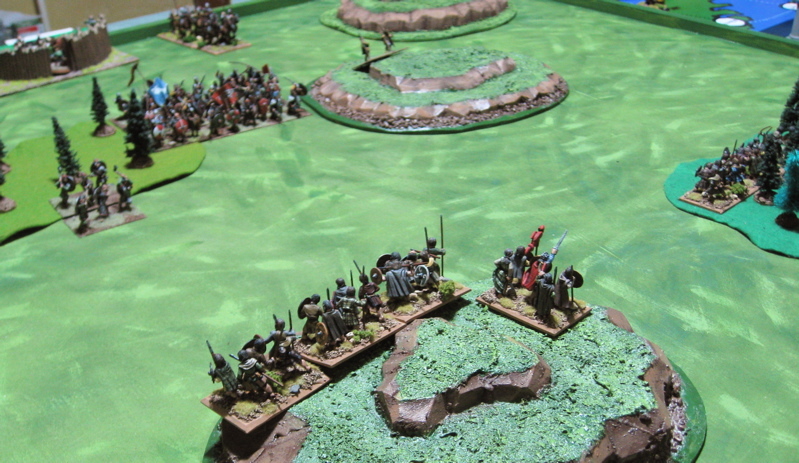 Things go poorly for the Vikings at the outset – the Welsh Smash through the center of their line slaying all before them. 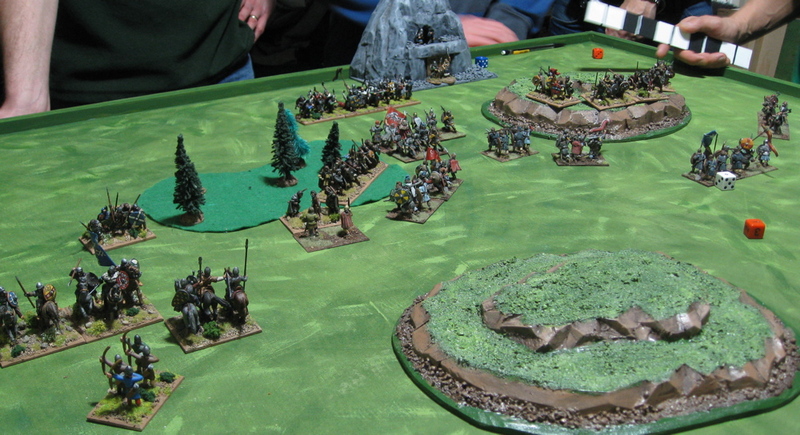 The Norse had some success of their own a little to the right of the Welsh devastation. 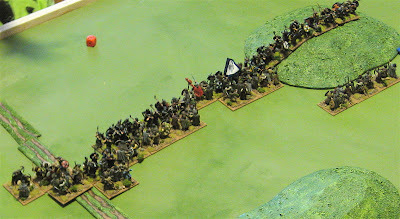 The Vikings on the hill charge down at the Welsh, who were too damn tired form walking all the way from York to go marching up another damn hill to fight some blasted Vikings sitting on the very top! The momentum from their charge scattered all before them and set the Welsh to route! 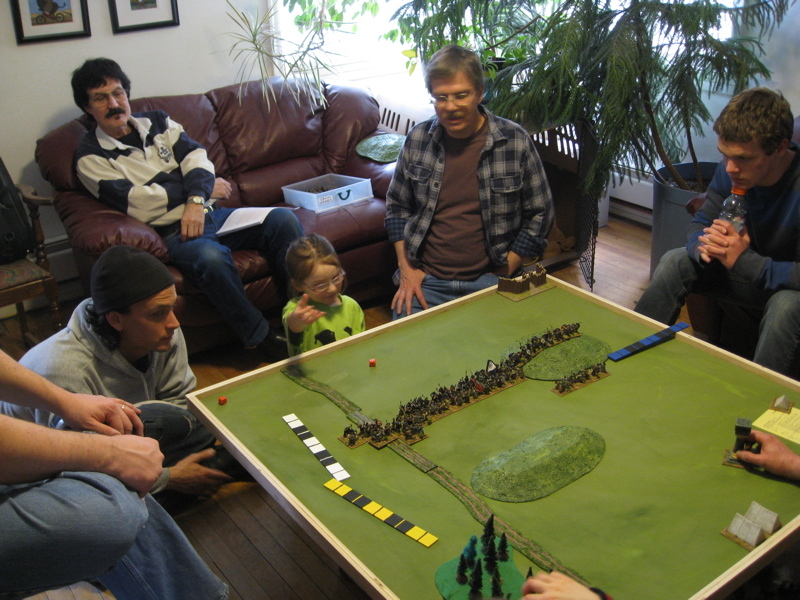 I think this is actually a picture taken after everyone retreated to winter quarters…. Very little took place in the Autumn of Year Two. 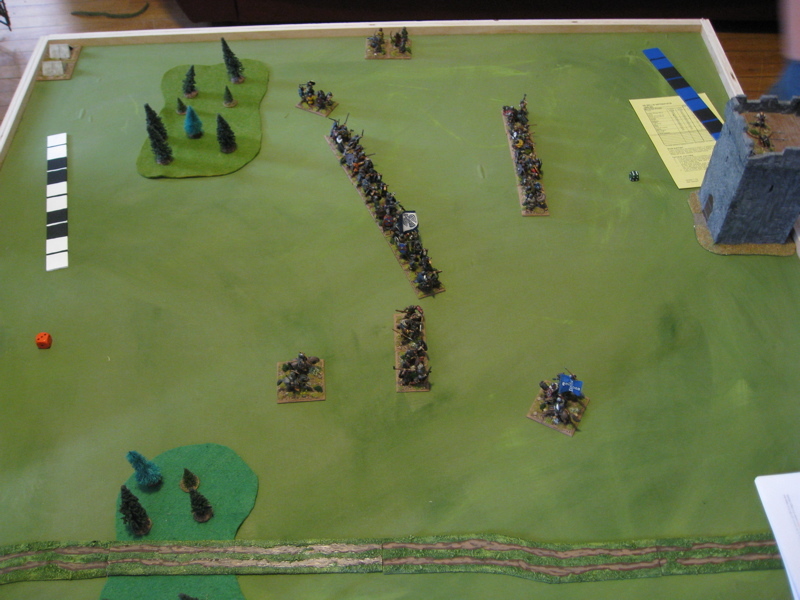 Wessex and the Scots continued their respective sieges without success, both armies had to return home less a few of their comrades. The Irish getting bored of Loch Garman (and drank the local pubs dry) marched to Duiblinn hoping a fresh view of the sea and fully stocked alehouses would lift their spirits. The Normans marched south to Canterbury, perhaps preparing for their return to Normandy. At the end of Year Two we actually though we might get in a fourth year… but it was not to be… By the end of Year Three everyone had had about as much excitement as they could handle in one day… Stay tuned for the report of that final and most turbulent year! 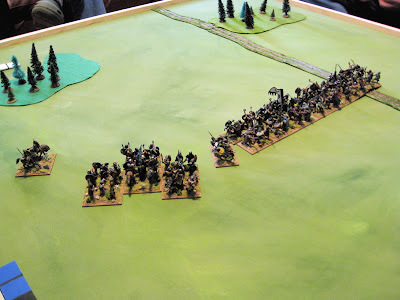 This weekend I hosted a Dark Age DBA campaign. I've been dreaming of running an historical DBA campaign since I first got a copy of the game nearly 22 years ago. 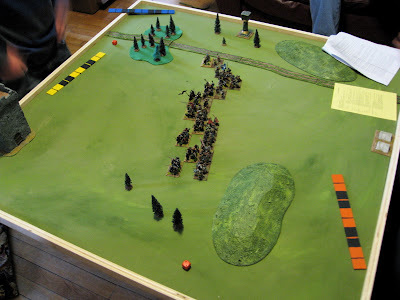 The first campaign I tried to orchestrate was the Alexander the Great 334BC Campaign. I had six players organized. 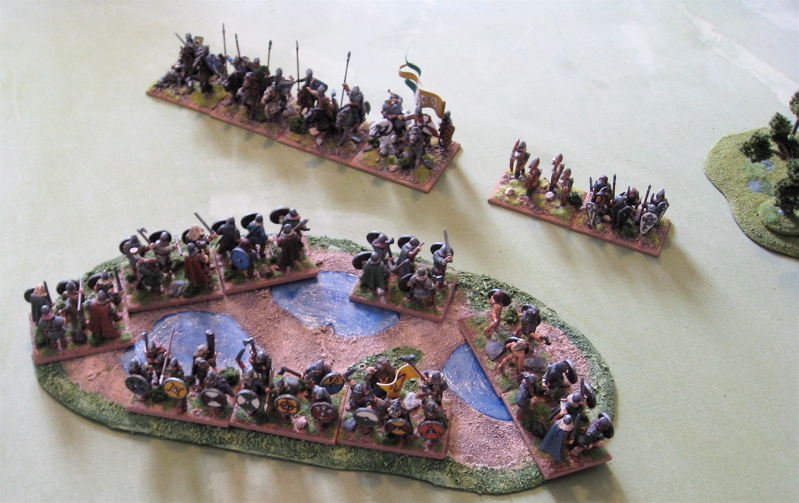 Most of us bought armies (mostly 25mm Rafm - Armies of the Helenistic Era - with a few Ral Partha here and there). 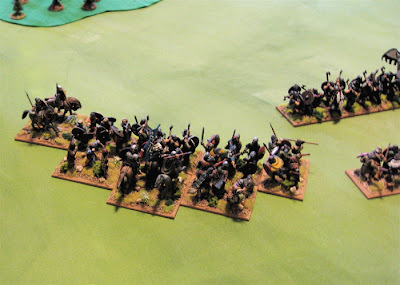 I had the later Achaemenid Persians. I think I may have been the only one to ever paint an army of that group. 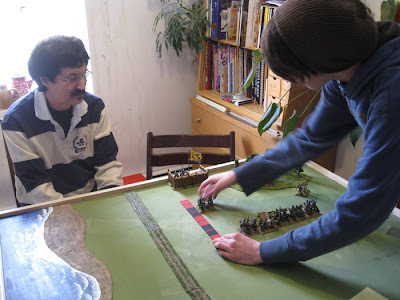 Mike and Cory and I played a few games (Mike and Cory with unpainted minis...). I think Cory may have eventually painted his Scythians... I have no idea what even happened to the others armies... John had the Later Greek Hoplites... I'm not even sure what Mike had (Thracians, maybe? ), or who the other players even were...? Jay...? Todd...? Christian...? 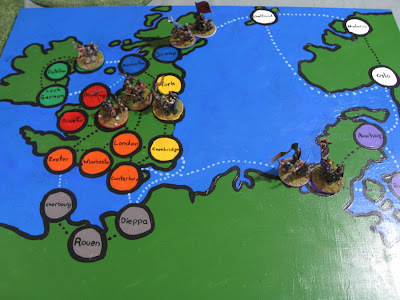 I've been planning on running a Dark Age campaign focused on England for some years... 15 years, maybe...? 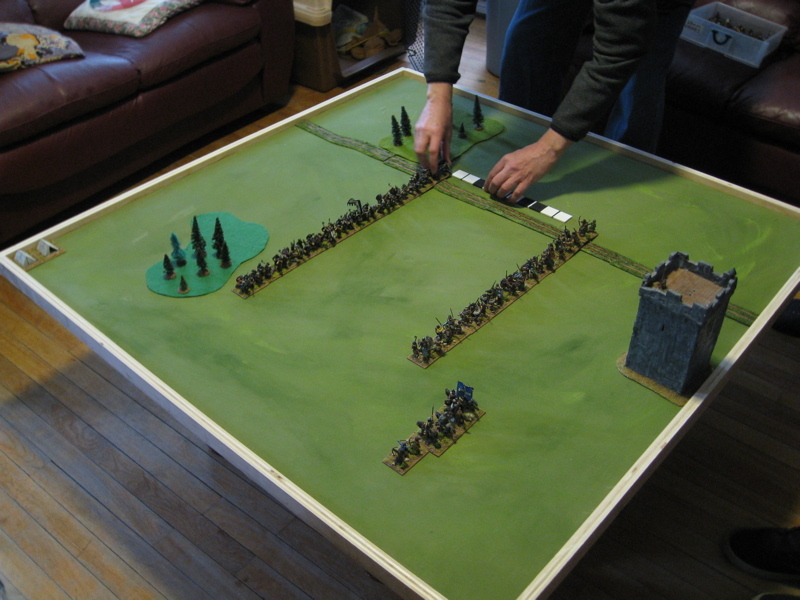 Originally I'd bought all the armies in 15mm... then I discovered I HATED painting 15mm figures. Over the last 5-10 years I traded away the 15's and acquired all the armies again in 25/28mm... and finally (FINALLY!?) finished painting them all this year - I actually planned this campaign over this weekend (of my 40th birthday) as an impetus to get them all finished!? 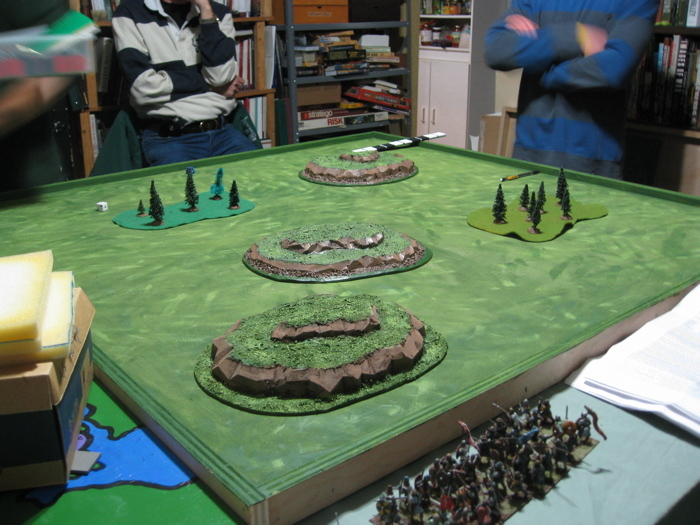 We used the 3 February 2012 draft of the new DBA3.0 rules (with a minor modification to the terrain set-up rules) with DBA2.2 lists. There were eight players, I provided six of the armies (Cory and Gary brought their own). 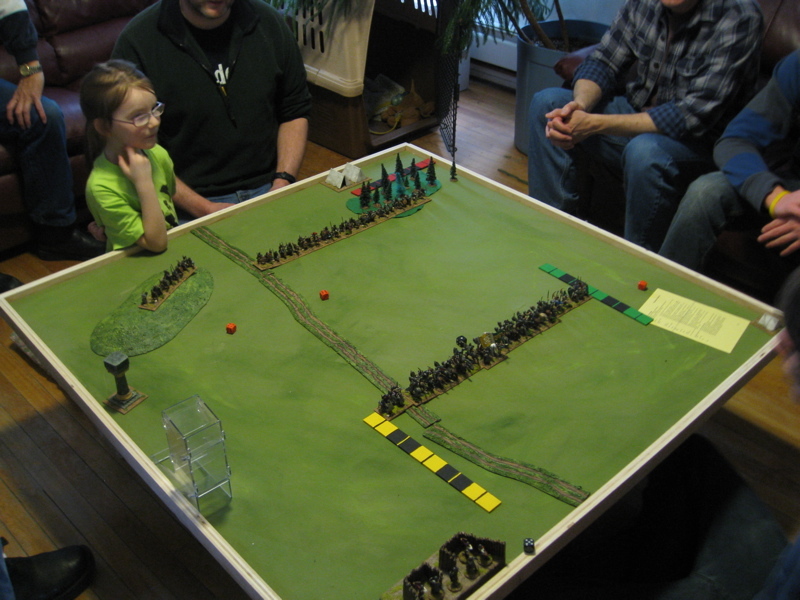 We had a bidding system to determine who would have first choice of armies. Everyone bid the number of elements they would be willing to start without at the beginning of the game – highest bidder had first choice and ties were broken by dicing. 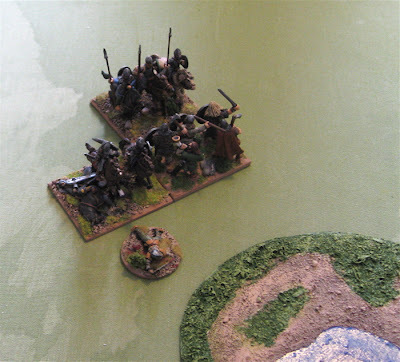 Rowan bid four and took the Normans. John , Rick and Jackson both bid two, and everyone else bid zero. One difference from previous campaigns was that I didn’t allow for recovery of troops after battle. 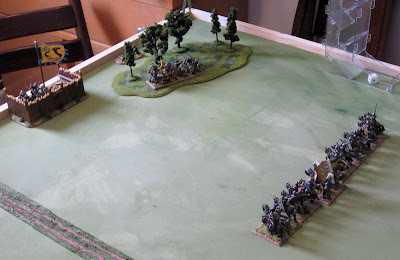 I found that in previous campaigns it compounded loss - as those who were victorious were more likely to recover their troops - quite often in the following season the vanquished would be facing a full-strength army with their own at half strength. 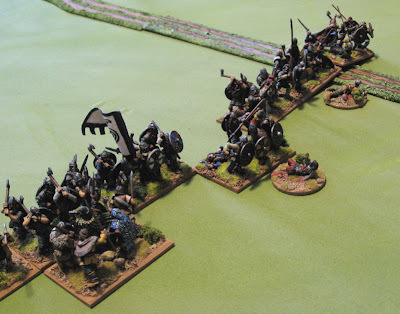 The Norse declared war on the Scots. The Normans declared war on the Danes. 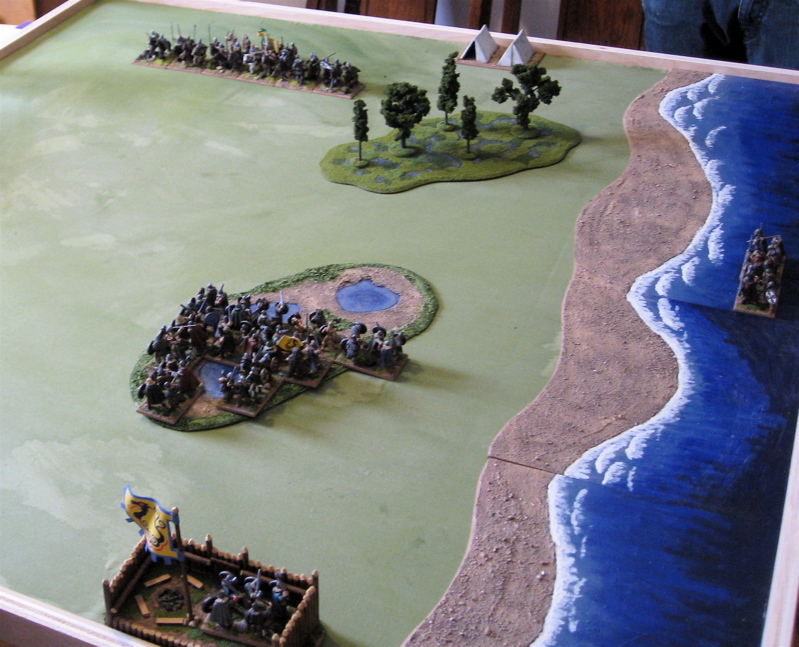 The Danes declared war on Mercia. Wessex declared war on Wales. And that was it! The rest (Ireland, Scotland, Wales, and Wessex) were all peace-lovin’ hippies or something and didn’t make any declarations of war….!? I think everyone was feeling a little timid and didn’t want to burn any potential allies by declaring war on the one country that hand’t declared war on THEM!? The Norse sailed for Burghead and there met the Army of the Kingdom of the Scots. The Normans sailed for Ribe and caught the Danes in preparation for their own invasion of Normandy! The Mercians holed up in Lincoln expecting invasions from the Welsh or the Danes. The army of Wessex Marched to Nottingham – presumably to aid in the defence of their English ally. The Welsh and the Irish Stayed put. Rick and Terry setting up their respective armies. 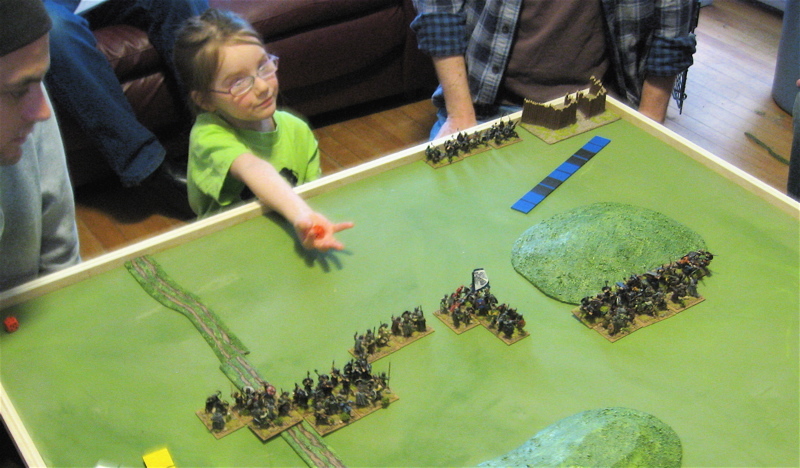 Of course it matters not how you maneuver when the gods are on your side (or Keira is rolling dice for you)… The Vikings have thrown off their attackers and crashed into the Scots main line - one continuous wail of cries at bones shatter, shields splinter and bodies are torn asunder! 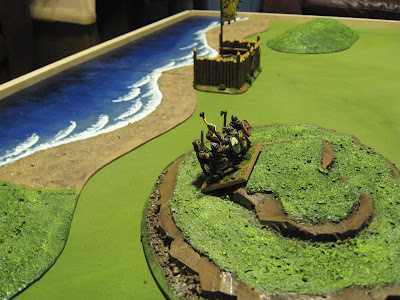 The might of the Vikings destroys and scatters all that stand before them. 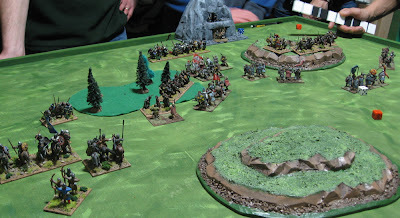 Back to our regularly scheduled destruction and scattering… aaaaand that’s the game – Burghead has fallen to the Norsemen (who also scored 3 victory points) and the Scots had to skulk back to their capitol of Scone. 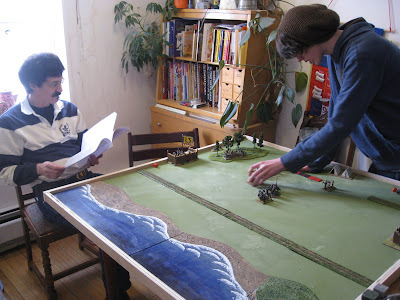 Gary and Rowan setting up their armies. Finngan volunteered to help out with the dice rolling for both sides! 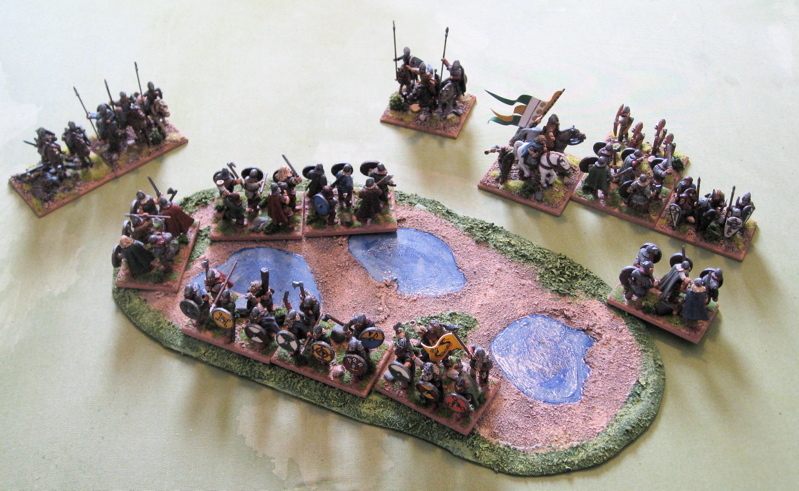 All set up, the Danes are all hiding in a swamp… except for a few preparing to make an amphibious assault to the Normans rear in an attempt to sack their camp. Duc Rowan of narmandy bravely leads his knights in search of the perfidious Danes. The Normans successfully locate the Danes hiding in the swamp, but they’ll be damned if their going to get their precious horsies all muddy going in there!! 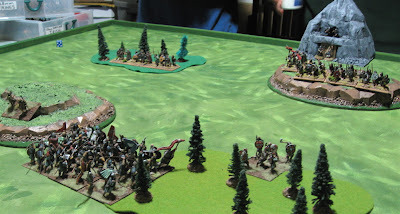 They also charged out at the Knights guarding the camp!? There was a fair bit of bashing around back and forth over by the swamp. Then the Danes unhorsed poor Duc Rowan! 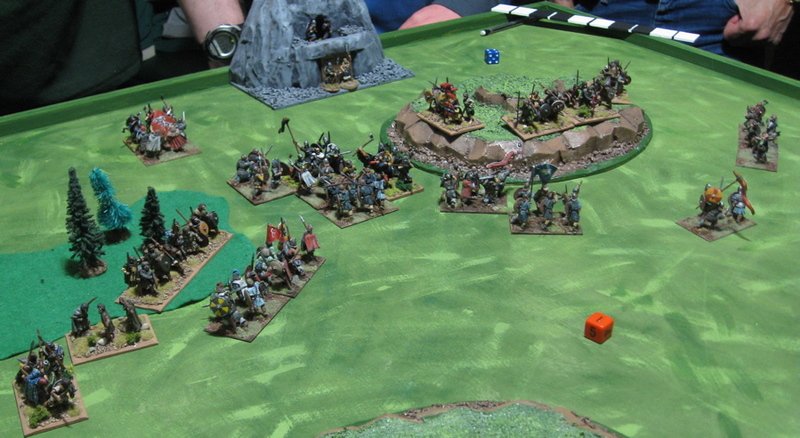 This probably should have ended the game but I think I may have made a bad call and the game continued another round which saw a few more blade ridden down by the Knights and the battle ended a victory for the Normans. 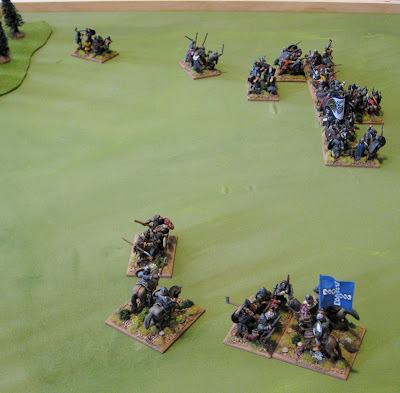 They had lost their General and an element of Bows, The Danes lost Four Blade and their berserk Warband (for a total of 2 Victory Points for the Normans) and the Normans took control of Ribe. 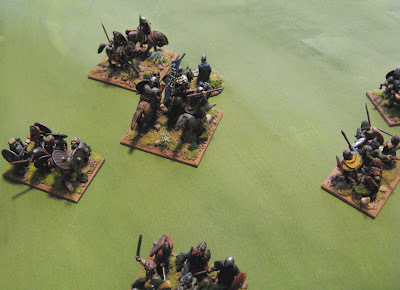 Meanwhile over to the East the Normans, for some reason, decided NOT to pursue the Vikings to Roskilde and instead marched north to lay siege to Aarhus. The Danes arriving in Roskilde, realizing the Normans were not hot on their heels, marched back to Ribe and Besieged the Norman garrison there. The sieges continued through the summer and into the fall, weakening the besiegers without capitulating. 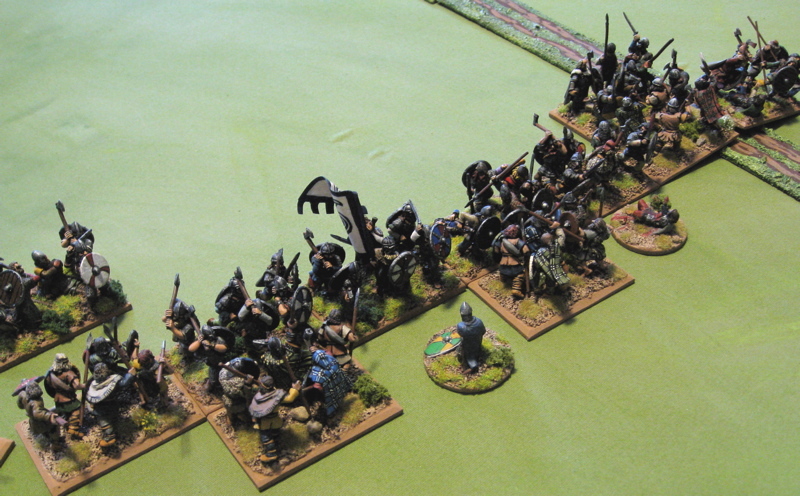 The Scots line up out front of Scone to once again meet the Norse invaders. 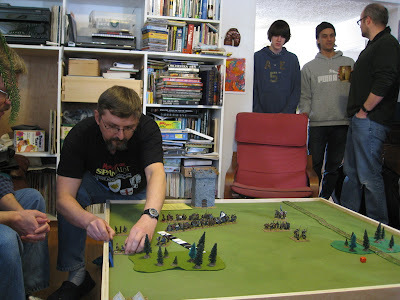 Terry King of Alba maneuvers his forces. 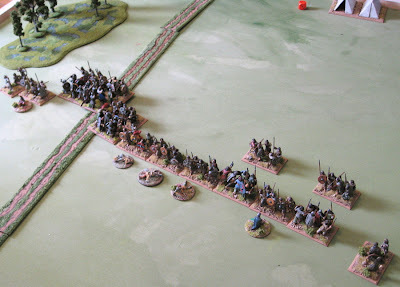 It seems the Scots tried some fancy maneuvering – galloping Light Horse around the flanks, sending the Psiloi off down the other flank, vainly in hopes of sacking a camp – all the while leaving the hopelessly depleted “main line’ dangerously exposed on their own flanks. The best part of the day was just getting to hang out with folks we haven’t seen in far too long and getting a chance to catch up. Cory and Rowan traveled from Calgary for the weekend and Terry drove in from Edmonton, despite warnings of a late winter storm brewing…. 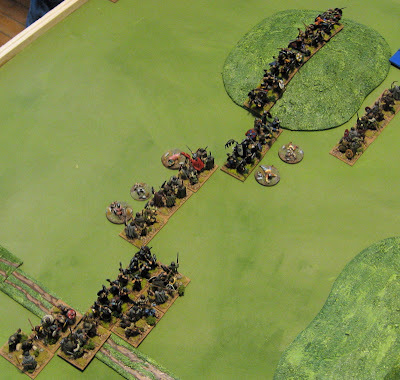 More of a disorganized brawl than a proper battle, but it got the job done… Scone fell to the Norse and The Scots accepted King Jarlrick of Norway as their Overlord. (And The Vikings scored another 2 Victory Points). 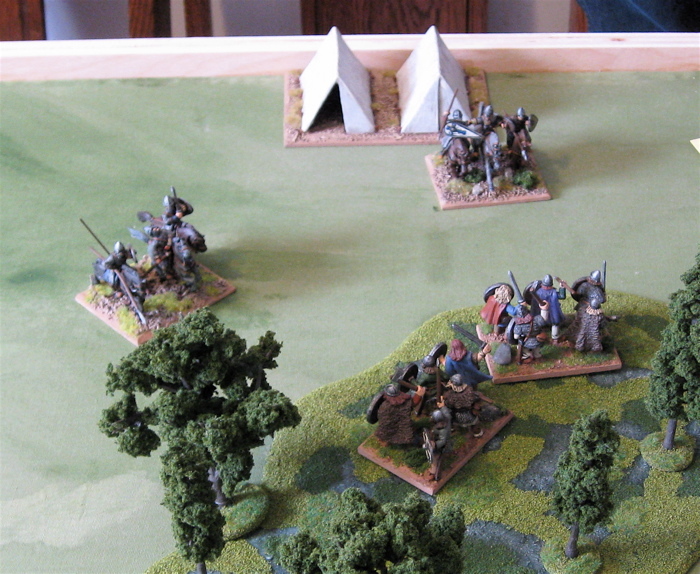 The Welsh and the Mercians meet in a field outside of Nottigham. 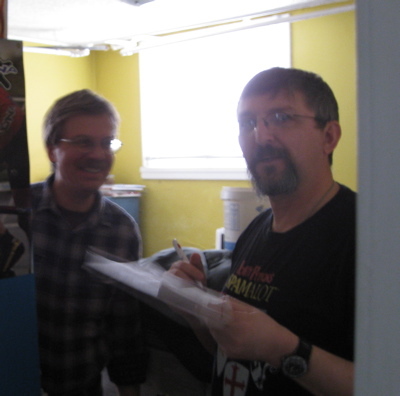 I think Christian is trying to unsettle Jackson here by pleasantly pointing out that he is utterly DOOMED! In one round of combat the Welsh lay down a devastating defeat HALF of the Mercians starting army is wiped out (Remember Jackson bid two to get this army at the start of the campaign and so only started with 10 elements). Nottingham fell to the Welsh who also gathered a whopping 5 Victory Points! This isn’t actually the Autumn moves picture because I am a daft twit. This is a picture of the Summer outcomes… The English have retired back to Lincoln. 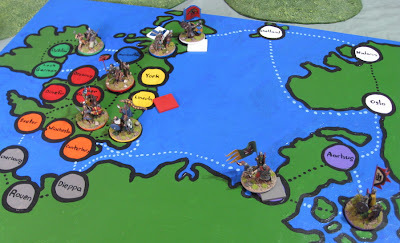 The Norse have retired back to Burghead, leaving Scone in control of their new vassal. 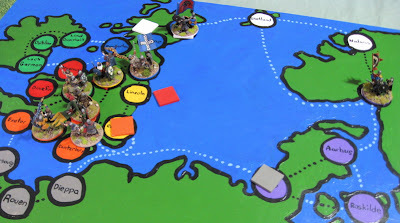 The Normans and Danes also continues their sieges, but eventually both had to abandoned them as the shill winds heralding the arrival of winter began blowing in off the North Sea . Unfortunately thos winds whipped up into a howling fury as the danes tried to cross to winter quarters in Roskilde and all that remained of their tattered army was utterly wiped out!? Wow… What a year!? The Scots are vassals of the Norse. The Mercians are vassals of the Welsh. 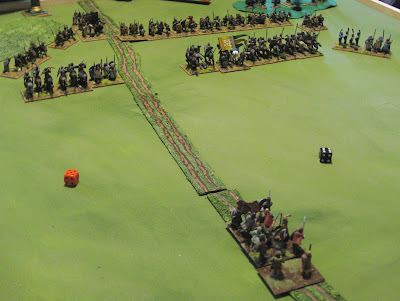 The Danish army was completely WIPED OUT in a storm! ?